Dieses Produkt ist leider nicht mehr lieferbar. 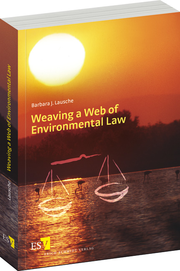 This book is the very first attempt to describe the development of environmental law. In particular, those developments under the auspices of the Environmental Law Programme of the International Union for the Conservation of Nature and Natural Resources, and within the network of the International Council of Environmental Law and all concerned national and international agencies and organizations. With its comprehensive treatment of the subject at national, regional and global levels, this publication shows how decision-makers were supported with information, legal analysis, advice, drafting of legal provisions, and capacity building, leading to the maturation of environmental law and its interconnection with sustainable development. In diesem Buch wird erstmals die Entwicklung des Umweltrechts dargestellt. Insbesondere beschreibt es chronologisch und umfassend die Geschichte des Umweltrechtsprogramms der IUCN (Environmental Law Programme of the International Union for Conservation of Nature and Natural Resources – IUCN ELP) seit seiner Gründung und des Netzwerks aller dazugehörenden internationalen und nationalen Vertretungen und Organisationen.